SMEs are typically poorly prepared to defend themselves, their digital assets and their client’s data and privacy against cyber threats compared to large enterprises. 60% of targeted attacks in 2015 were aimed at small businesses, while ‘more than 430 million new unique pieces of malware’ have been discovered, with consequences ranging from minor impact on operational efficiency to detrimental effects on the profitability and/or on the supplier – customer – partner relationship. Clearly, cyber threats comprise a major risk for (European) businesses and as a rule, their vulnerability increases as their size falls. With cyberattacks skyrocketing in number and continuously evolving in terms of sophistication and novelty, effective protection and response can become a major differentiation and competitive advantage for European SMEs and especially those, which traditionally do not possess the appropriate resources and/or the relevant expertise. 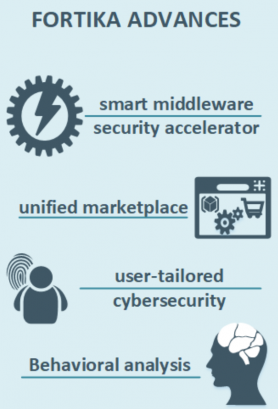 This is where the opportunity lies and where the FORTIKA concept fits best: the proposed hybrid solution (hardware – software) will consist of a security ‘seal’ for micro, small and medium-sized enterprises that will reinforce trust and facilitate further adoption of digital technologies, strengthening this way their position compared to the non-European competition. To accomplish this ambition, FORTIKA industry partners will roll-out to the market a new generation of cyber-security products and related services based upon the results of the proposed innovation action. The project will work towards more robust, resilient and effective cybersecurity solutions that can be effortlessly tailored to each individual enterprise’s evolving needs and can also speedily adapt/respond to the changing cyber threat landscape. To this end, FORTIKA will open its middleware platform to third-party cyber security applications and services through its marketplace.